SSC CGL is gaining popularity with every passing day and to get a post of your choice, it is important that you focus on your target rather than distracting yourself.With every passing year, more and number of students are writing the SSC CGL exams. Even the students from the colleges like NIT, PEC, Thapar University are interested in the job profiles. And to beat the competition, you need to sharpen all the skills that you have. 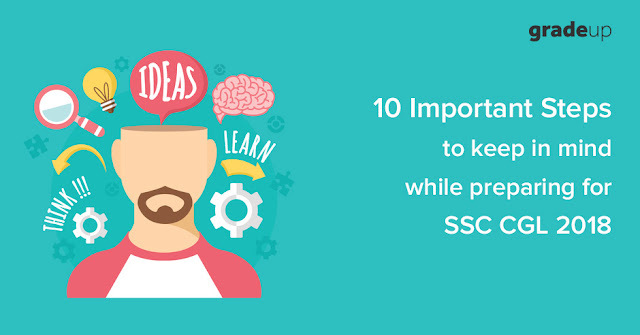 Not only you need to be good in Maths and English, but also you need to have a sound strategy to get the job.In this post, we will share 10 important steps to keep in mind while preparing for SC CGL 2018. SSC CGL 2018 exam is not too far away. If you have just started preparing, the first and foremost thing to do is to know the pattern. How many levels are there; what all subjects are coming; which posts are you targeting (AAO, Statistical Invigilator, ITI, Customs, ED, CBI etc. ); what was the last year cut-off and the exam calendar(don’t rely too much on this!). Please read the notification properly before applying and fill all the details with utmost care. SSC asks for post preference. Don’t fill that alphabetically as you might not get a chance to change it afterward. Consider all the factors like what kind of job you want to do, where you would like to settle etc. Consult your family or ask us in the comment section. Get to know the syllabus thoroughly. By thoroughly, I mean you need to analyze some previous papers and find the important topics that are getting questions regularly. Please understand that if you are preparing for CAT or UPSC or IBPS, SSC is an altogether a different ball game. The GK questions asked in SSC are different from UPSC and the level of DI in SSC is not as much as in CAT/IBPS. Please note down the topics that are being asked constantly in the exam. SSC CGL is changing fast and the level is not same as it was 2 years ago. Also, being a computer-based test now has its own perils. It is important to know the level of difficulty of questions. Though the exam is computer-based, you must purchase previous year question books. The Advance Maths section of SSC CGL 2016 mains exams and Tier 1 of SSC CGL 2017 was much more calculative as compared to previous years. Even simple questions involved a lot of calculations. If you have not given any Government Exam, better to start in a traditional way. Take a book which has all the chapters with the concept and start learning. Finish the syllabus in a timely manner i.e. 2-3 months before the exam so that you have time to hone your skills and give mock tests. Finish the complete syllabus, English, Maths, Reasoning, General Awareness (Stats and Finance if you are applying for Stats or AAO posts). SSC CGL is based on your time management. If you are able to do 100 questions in Quantitative Aptitude in Tier 2 in a given time with good accuracy, you can easily steer ahead of the completion. For this, you need to know the tricks, the short-cuts and the formulas which cut the length questions to a few words. Even English has some tricks, learn those. It takes time to get over your weakness. It’s a give and takes the thing you devote time, you can win. Since the notification is yet to release, you can start studying at least 3 hours a day in clearing your concepts and know the subject by heart. Cover each and every topic, buy previous years question banks and cover each and every concept. Don’t leave any stone unturned. Since the exam is computer bases, it is must to get yourself well averse with the computer-based tests. Join a test series which have number of tests and has similar questions like the main exams. We at Grade-Up have a team of dedicated professionals which have cleared these examinations who make these mock tests at par with the actual tests. With the number of students giving the mocks crossing lacs last year, you can get an actual feel of the SSC CGL with our test series. There is a detailed analysis and ranking provided after each mock test. Keep yourself motivated. SSC generally takes huge time to complete the selection process. SSC CGL 2016 was expected to get over in what the Commission said a record time of 8 months as it usually took more than 2 years but it is stuck in Court Cases and the students who have cleared SSC CGL 2016 are yet to join. The dates of exams keep changing, already date of Tier-2 of SSC CGL 2017 has been changed more than twice. SSC CGL 2013 was over only in 2015 and joining in some departments took place in 2016. People who got selected in SSC CGL 2014 joined in mid-2016. Selected students from SSC CGL 2015 joined in late 2017. Unlike IBPS, SSC takes a lot of time. It is therefore essential to stay motivated right through the process. Many students stop preparing due to lack of interest. SSC CGL being a multi-level exam needs constant effort. You don’t have time to be happy until your last tier (sometimes a court case, pun intended) is over. You may be good at academics and might have scored 175/200 in Tier 1, but you can be out of the race if you don’t do well in Tier 2 and Tier 3. Tier 2 has the record of breaking thousands of such dreams. Mains is the most important stage. You have to give your best at every stage. Similarly, if you have barely crossed the cut-off in Tier-1, you can still get the desired post by scoring well in Tier 2. Don’t get sick due to pressure. Get a sound sleep and proper diet. Ensure that you have a minimum of 7 hours of sound sleep every day and eat healthy meals. Strictly no to outside food before 10-15 days prior to exams. Last but not the least, get connected with like aspirants like you and know the latest stuff by simply downloading SSC CGL preparation app.